Put up at my favorite, Glow Pratunam Hotel this time! I’ve tried so many different hotels in BKK and I still love this the most. The service and rooms are impeccable! Even the room service food is nice yumzzz! Room service cheese fries! Quite alright but I still think the fried rice w chicken wings DA BEST! Met Jor and Gemma who were coincidentally staying at Glow too! Headed to Audrey @ Siam Center for dinz! Snapback and jacket coming up on TJM soon! Tom yum prawn pizza (VERY YUMMY!!! ), Tom Yum pasta, Salmon salad, Beef noodz. Look at the jacket!!!! I LOVE IT! Thai iced tea milk tea which was surprisingly delightful! As you can tell from the pictures, Audrey Cafe is inspired by Audrey Hepburn especially “Breakfast at Tiffany’s” if you have watched that movie. Being an Audrey lover, I was really happy to be dining there though the food wasn’t impressive except for the pizza and cake. The decor is really parisian and sophisticated so thumbs up for that! Audrey’s located at Siam Center and Thonglor! Brought them to massage at Number one, @ Petchburi rd soi 15. Good morning (day 2) from the most comfortable bed on earth! 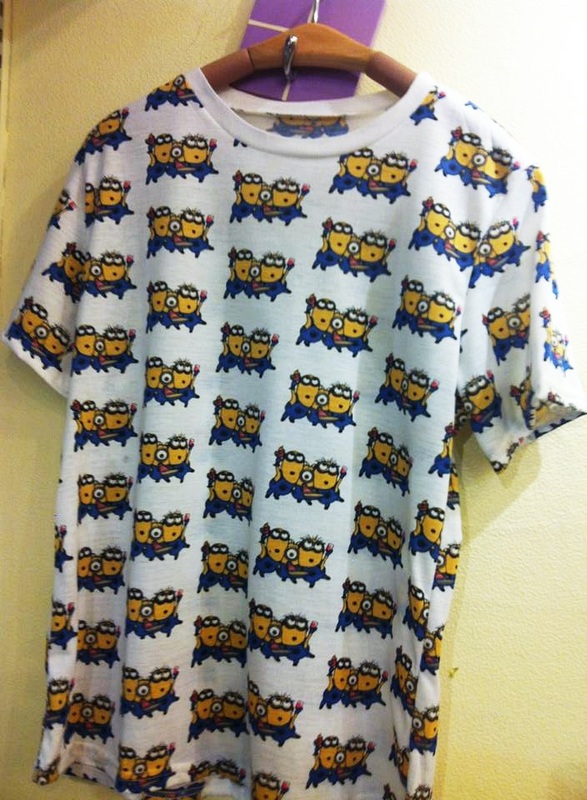 Did shopping for myself on the second day and bought myself and Daniel a minion t-shirt!!!! I super love minions, I think they are the cutest cartoons EVER! I went nuts when I saw the t-shirt!! Hahah gonna force Daniel to wear it. So, as my title goes, this is gonna be my last bangkok post on my blog unless I go there for leisure purposes. I will also stop answering questions regarding BKK on my askfm. I know some people will still try their luck but don’t bother cos I’ll delete any questions regarding BKK. I had done numerous blogposts on BKK and a BKK guide so you can refer to those if you want to find out more. I have my reasons for doing this, so please understand X.
I will still be posting pictures on instagram when I’m there though, so you can follow me on IG if you haven’t. Off to shoot for TJM now!